Golf, like most outdoor sports, is subject to the elements, so always be aware of what to do if a potential danger arises. Every golfer should be prepared to handle an on-course emergency, whether it is a medical situation or the sudden onset of bad weather. When playing a course for the first time, golfers should learn if emergency call boxes are available and where the nearest storm shelters are. This information will help the golfer handle an emergency situation without panicking. A medical emergency on the golf course should be handled the same way as it is off the golf course--calmly and quickly. If a fellow golfer is in distress, call 9-1-1 and then the pro shop to alert them of the situation. Some golf courses have medical supplies, including defibrillators, and can bring those supplies to your location. If you are trained in CPR and a fellow golfer is struggling to breath, begin administering CPR. If the medical emergency potentially involves a broken bone or other skeletal injury the injured golfer should not be moved. 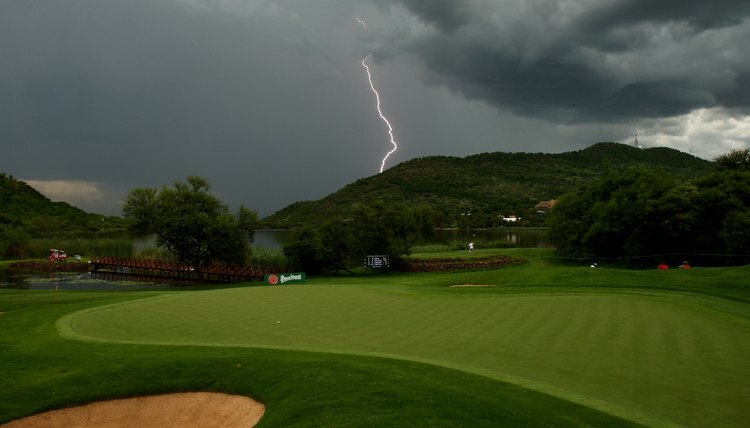 Most golf courses post information about what to do when lightning strikes. In places where lightning is common, shelters should be found around the course. According to Lifesaving Resources, Inc., golfers should seek shelter from lightning by going inside a building (clubhouse or rest room) or under a lightning shelter. If getting inside is not possible, golfers should crouch in the lowest available spot with their feet on the ground. If caught in an open space, such as a fairway, golfers should get away from anything that will conduct electricity, including the golf cart, golf clubs, metal fences or individual trees, and stay low to the ground. Do not use cell phones. A flash flood is defined as one that rises and falls with little or no warning, according to the American Meteorology Society. Areas near creeks, streams and rivers may be subject to flash flooding. Golfers should note where water comes into play on a golf course and should pay attention to weather. While many golfers opt to wait out a rainstorm in a shelter, they should monitor how much rain is falling, how quickly it is falling, and their proximity to a potential flash-flood site (i.e. a creek). Golfers should seek shelter on high ground or inside a building in the event of extremely heavy rain, and they should stay clear of water sources. Flash floods can occur in any state, though the South, Midwest and low-lying areas in all regions are particularly susceptible, according to Wyoming Homeland Security.